The airline has closed reservation for flights to Silchar, Imphal, Aizawl, Jorhat in northeastern states from mid-February. Reservation has also been closed for flights to Madurai, Visakhapatnam, Raipur, Muscat and Sharjah. 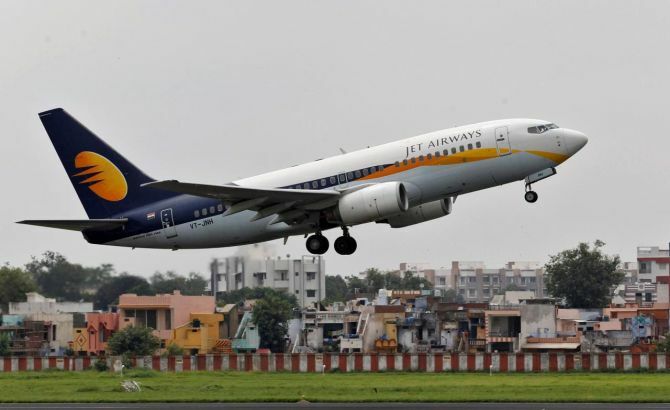 Jet Airways is suspending flights to destinations in the northeastern and southern India, and in the West Asia to trim losses. The suspension is a part of route rationalisation, which also sees the airline increasing flights from its Mumbai and Delhi hubs. The airline has closed reservation for flights to Silchar, Imphal, Aizawl, Jorhat in northeastern states from mid-February, leaving Guwahati its sole destination in the region. Reservation has also been closed for flights to Madurai, Visakhapatnam, Raipur, Muscat and Sharjah. The move, while helping the airline cut down losses, will also result in layoffs at these airports. The route rejig is being carried out in the backdrop of low fares and increasing operating costs. The scaling down of routes to the northeast comes within nine months of launching new flights to the region. In March, the airline had introduced new frequencies from Delhi to Aizawl, Silchar and Jorhat, and had announced plans to make Guwahati its regional gateway. Thirty new flights were added to the region, increasing weekly connections to the northeast to 184. However, poor loads and widening losses have led the airline to slash down its flights. An aviation expert said these were thin routes and the airline was unable to fill up its Boeing 737 planes deployed on the routes. "The airline will be saddled with overheads if it is unable to effectively redeploy the planes and staff," the expert said. Also, the airline will need to adhere to route dispersal guidelines, which mandate deployment of certain percentage of capacity to routes in Kashmir, the northeast and other regions. The airline has already trimmed its network, withdrawing connections between Kerala, Mangalore and West Asia, while adding international frequencies from Mumbai and Delhi. As many as 39 weekly flights to West Asia have been cut following the rejigs. The airline has added flights to Bangkok, Dubai, Doha, Kathmandu, Manchester and Singapore from Mumbai, Delhi and Singapore. In a statement, Jet said the suspension of operations at these nine destinations would provide it with economies of scale at other airports. "Effective February, Jet’s average departures per domestic station will increase by 6 per cent. "These changes do not mean that Jet has given up on its growth ambitions. "In fact, we are still growing and these aircraft would be redeployed on other routes. "For example, effective December, the airline has introduced 65 additional weekly frequencies on its international and domestic routes, thus, strengthening its network over its hubs of Mumbai and Delhi. "The airline continues to and will adhere to the route dispersal guidelines mandated by the government of India," the airline said. Jet also confirmed layoffs but did not provide a figure of job loss. "We understand and regret the difficulties these changes will create for our employees and their families at affected stations. "The airline is committed to ensuring that their separation process will be in accordance with their terms of employment and all applicable regulations according to the law. "Such a process is never easy for employees or the employer, but Jet is having to make these difficult decisions in the larger interest of preserving long-term viability for the organisation," the company said. Will Tatas buy majority stake in Jet Air?